French President Nicolas Sarkozy is showing us several significant nonverbal signals in this image. Certainly we all know the "Shsss! ", "Quiet", "Don't speak" symbol - holding a finger up to the mouth. Even without making a noise, its meaning was obvious to us all early in childhood. 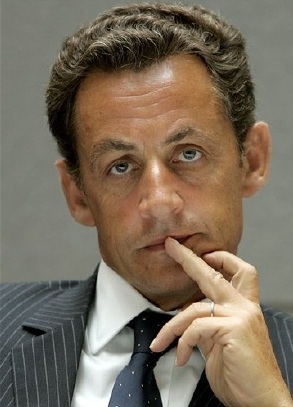 Sarkozy doesn't like what he's hearing and he's subconsciously "shsssing" the speaker. But Nicolas is also displaying another nonverbal in this image. An emblem is a term used to describe a very specific sign that has a precise meaning within a culture or geographic region - and occasionally it's a nearly universal signal throughout most of the World. A "Partial Emblematic Slip" (Ekman) is when such an emblem is displayed in a non-traditional position and subconsciously generated. Such is the case here - for Mr. Sarkozy's subconscious is not only trying to quiet the speaker - but he's also cursing at him/her with the universal emblem, "giving the middle finger" aka "the bird". When this partial emblematic slip (or any other negative nonverbal) is accompanied by positive words, statements and answers, etc. - there is an obvious and dramatic disparity present between what is felt and what is being said. Never believe the words, as this is very strong signal of deception (Ekman).